A report presented to the Annual General Meeting of the China Council for International Cooperation on Environment and Development (CCICED), chaired by Li Keqiang, vice premier, in Beijing yesterday and to Premier Wen Jiabao concludes that China has much to gain from taking an early start in the development of a low-carbon economy and should seriously consider carbon intensity targets in its next 5-year plan. 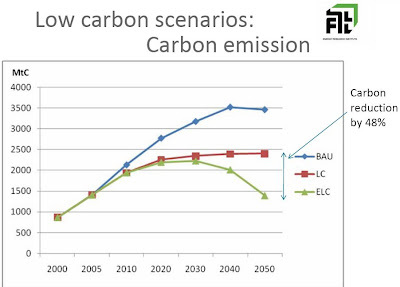 The proposals of the Low Carbon Economy taskforce are partly based on a set of energy scenarios produced by the Chinese Energy Research Institute. Drawing on five pillars (energy, urbanization, industrial restructuring, innovation and land-use change), the report outlines specific recommendations to put China on a path that will reduce energy consumption per unit of GDP by 75-85% by 2050. If implemented in the short term, that is within the 12th 5-year plan, carbon emissions per unit of gross domestic product could drop by 20-23% or possibly more. The proposals are partly based on a set of energy demand scenarios produced by the Chinese Energy Research Institute. One adopts a continuation of current trends that will result in the production of nearly 13bn tonnes of CO2 per year by 2050. 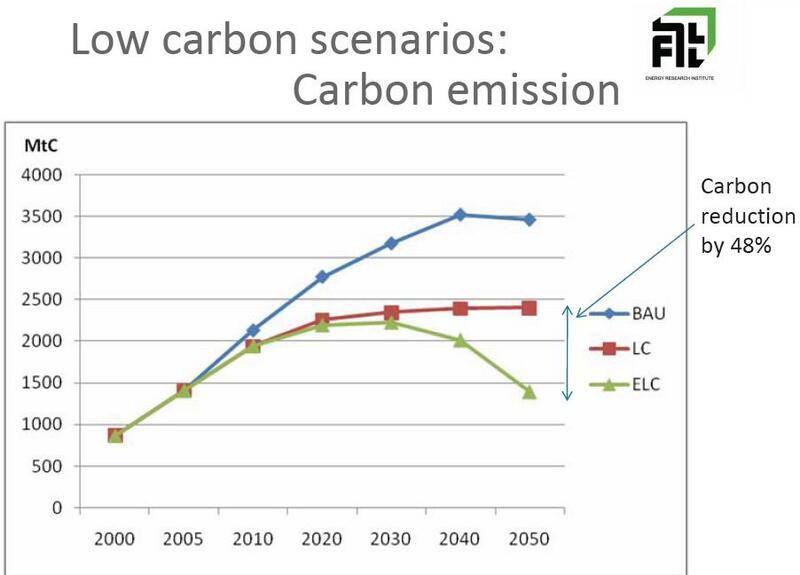 A second, produced as a "low-carbon scenario", reduces emissions to nearly 9bn tonnes. A third, more radical "enhanced low-carbon" scenario would produce peak emissions around 2025, reducing to 5bn tonnes by 2050. In each scenario China would continue its economic growth. However, the Chinese believe significant reductions can be achieved by decoupling growth from greenhouse gas emissions, as Sweden has done.